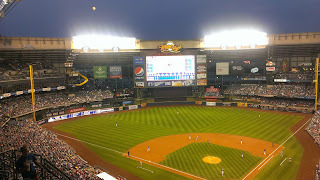 I went to a Brewers baseball game the other night with my family. We got discounted tickets for Sarah's good grades at school. They were the nosebleed seats in section 424 of Miller park. None of us went to a game last year and this was the first of this season. None of us are big baseball fans. We're a football family for the most part. I used to enjoy going to games at County Stadium when it didn't cost the GNP of Guam to go see a game. I can't complain this time because, on top of discounted tickets we got a $10.00 voucher (per person) as a "fan appreciation," measure by the owner Mark Attanasio. (Every fan for every game in August gets a $10 voucher.) It was a public relations face-saving measure for the Braun steroid mess. I give Attanasio credit, he loves the fans and always seems to know when to come up big. He's one of the best things that ever happened to this organization. Anyhow we went and despite being high up, the seats really weren't bad. They did an amazing job with that stadium. Much like Lambeau, there really isn't a bad seat. As I said, as a family, we don't have much patience for baseball. I was telling my wife that part of it with me is the 30 seconds between each pitch on top of the twenty minutes between each moment of measurable action that just makes the game drag on. Throw in a few-four-or-five pitching changes, and the 5 minutes at each half inning and, well, you lost me. I can do it, there are moments I actually really enjoy it, but for the most part, a game or two a year and I'm good. On a related side story, the family of four behind us had a couple of kids about 6 and 8 years old. At one point in the third inning, the eight year old said "Dad, how long does this game last?" The dad answered with "Oh, about three hours." To which the son asked "How long has it been so far?" Sorry to go all Andy Rooney on you, but I guess it's different strokes for different folks. The running time on this game ended up at about 3:40. I can barely sit still for a two hour movie. They try desperately to keep your interest in between innings, but I knew when they resorted to "Who works harder, the teacher, Mr. fill-in-the-blank, or the steelworker, Mr. fill-in-another-blank?" Really? Who thinks these games up? Anyway, we managed to use up our vouchers rather quickly. A micro-brew beer and a bag of peanuts pretty much took care of it, but like I say, it was better than me footing $40+ on food. Thanks again, Mark. It was an enjoyable night out for all of us. There were lots of lead changes and a smallish crowd so we could stretch out. Also it was nice not to have to deal with any drunks around us, either. There was one super-avid fan (might have had some issues) behind us, but he was harmless and funny. 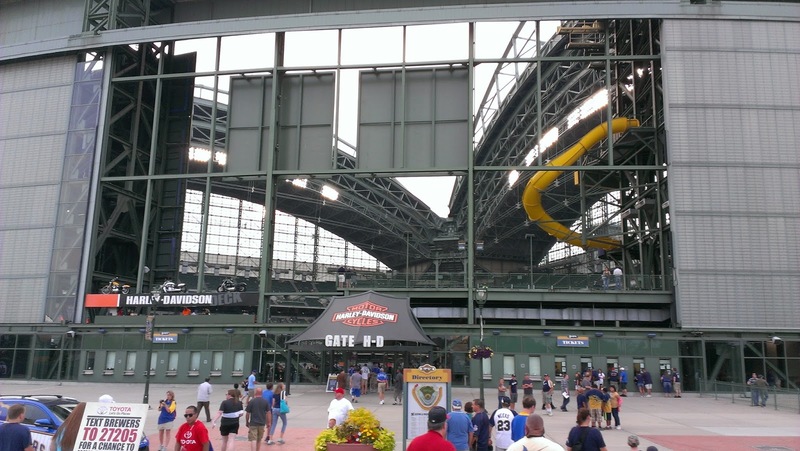 The Brewers ended up losing 8-5 when their pitching fell apart, but that's kind of the MO right now. With the Packers starting their regular season in a couple of weeks, I've pretty much put the baseball season behind me. I don't watch the playoffs or the World Series unless a team I care about is in either. I will be going to another baseball game in September when my nephew and his wife come, but until then it's all green and gold for this guy.